Good for him. He was great in Cleveland, and I wish he was still there. He also seemed to always have a knack for pulling a rabbit out of his hat when it came to making trades. His job with the Pels will be similar to the one he was originally hired for by the Cavs (where he hired Blatt, and drafted Wiggins 1st overall), but very different from the job he would end up having with the Cavs (after the first month or so). I thought he was solid in Cleveland overall. Now we’ll see if he’s up to being a true team builder. Pels might not be much on the court, but this roster/payroll is actually a good one to begin a rebuild. They have all their 1st rounders going forward, and nothing on the books after next year, except J.Holiday, who’s a trade asset. The booty from Davis and Holiday trades, plus their own picks, plus cap space could equal a relatively quick turnaround. That’s no fun. I don’t think Ainge can rip him off! the issue the lakers will have is that ingram is having bloodclot issues, hart didnt get better and lonzo had a bad ankle all year.. their value is low collectively. Cavs should have never let Griffin go. Its official. LBJ to the Pelicans. Pelicans are in good hands, can’t go wrong with Griffin. Contrary to belief, LeBron was (is) hard to deal with. Griffin won a ring, and against the GS dynasty, to boot. I’m the furthest thing from a Cavs’ fan. 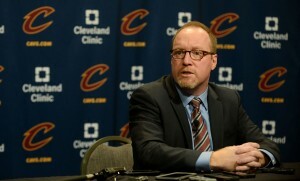 (NYK fan) Most teams’ fans, would be ecstatic with a David Griffin hire. Griffin should not have been let go by Gilbert/Cleveland. That set discouraging things in motion. By NOT holding onto Griffin for another year and NOT trading the Brooklyn pick, Gilbert denied the priority of the “James Window”. IDK if Griffin, an Irving guy, could have kept Irving settled but it is possible. Another NBA title was on offer. On the other hand the Irving-is-NOT-settled leaker was never identified. . . He’s a clever guy, this Griffin. . .
Here’s an idea, and since LBJ is a fan of DG, let’s put it out there: Trade Bron to the Pels for ANYONE EXCEPT AD. Shoot, send the remaining roster for Bron, and fill in w/ 1 yr contracts and Rookies. Since LBJ wants to play w/ AD so much, do it. Let the Lakers come back to reality. This yr: 37-45. Last yr: 35-47. TWO GAME IMPROVEMENT, WITH LBJ!! HAHA!! Let the Lakers gain back some sense. IMO, shipping out Bron and letting another SS, say, K Leonard, others, THAT will help the Lakers into the playoffs at least. Again, IMO….